The Plum Ribbed Cardigan is a new vision of an old classic. Knit a reversible ribbed sweater jacket that clings to your curves. This 3X2 rib can be blocked for drape or take advantage of the elasticity of wool to let it hug you all you’d like. Choose the yarn that suits you and your climate, buttons that allow for versatile wear, and you’ll get a lot of mileage out of a dependable favorite. Worked in pieces from the bottom-up, the added button band allows for creativity: you pick the number of buttons and sizes. This pattern requires knitting, purling, yarn overs, increases, an optional backwards cast-on, some basic sewing skills to add buttons and put the pieces together at the end. 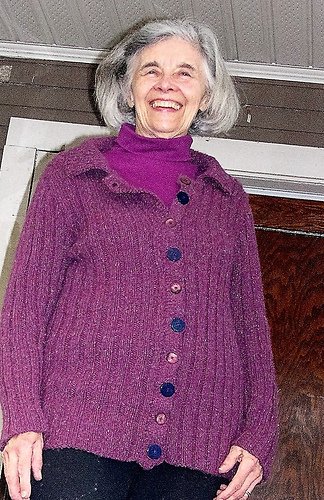 The Plum Ribbed Cardigan’s finished measurements are 36”(40”,44”,48”)/91(102,112,122)cm, using 1,150(1,350,1,540,1,825) yards/1052(1234,1408,1669)m of worsted or Aran weight yarn. 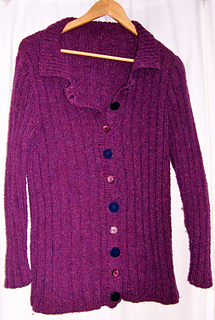 An older version of this pattern was published by Knit Picks in 2006. It has been revised to add metric and additional yarn suggestions.